Eco-Friendly Sunscreen: Have We Found the Key? When slathering on sunscreen before a warm day in the sun, the environmental consequences might not be the first thing that crosses our minds. However, over the years, there’s been growing evidence of the terrible impact that sunscreen can have on the environment. Thankfully, scientists have recently found a way to produce a key ingredient for an eco-friendly sunscreen. It’s always important to put on sunscreen to protect yourself from the harmful effects of the sun’s rays. The problem is, certain UV blocking chemicals in sunscreen have been linked to environmental damage. For instance, oxybenzone is a common chemical found in many sunscreens and has been shown to gravely damage coral reefs and marine environments. In fact, up to 14,000 tons of sunscreen enter and poison the coral reefs every year, many of which contain oxybenzone.¹ Sunscreen chemicals can also accumulate in the environment, posing an even greater environmental threat. Related: Store-bought Vs. Homemade Sunscreen: Buy Or DIY? The good news? Researchers from the University of Florida have recently found a way to make a key ingredient for an eco-friendly sunscreen, a biodegradable and environmentally friendly compound called shinorine.² The ingredient is traditionally harvested from red algae in the sea, but this has proven to be an unreliable source since the supply can vary greatly each year. Now, scientists have a discovered a new method of producing shinorine by bringing production out of the wild and into the laboratory. Using genetically modified bacteria, they’ve been able to produce shinorine in large amounts and establish a reliable production source of the ingredient. Though it may still take some time before shinorine can be rolled out into commercially available sunscreens, the research shows great promise for a new, potential eco-friendly sunscreen. While we wait for new environmentally friendly sunscreens to be developed, you can still do your part to make sure your sunscreen is doing minimal harm to the environment. First off, opt for sunscreens without oxybenzone and octinoxate, as these are UV filters that can be harmful for the environment. Look for sunscreens that are biodegradable, which are eco-friendly and break down naturally in the environment. Zinc oxide and titanium oxide are examples of sunscreen ingredients that are biodegradable. While the evidence for environmental harm of sunscreen is still growing, the evidence for the harmful effects of UV rays on human is well established. Make sure you still apply a broad-spectrum sunscreen with an SPF of at least 30 to protect your skin from UV rays. You can also use QSun to make sure you’re safe in the sun. Available for iOS and Android, the free app gives you personalized sun safety tips, such as how much sunscreen to apply and sunscreen reminders. It even tells you how long you can stay outside before getting a sunburn. There is a way to find out how much sun is enough based on your skin type. Would You Take a Sunscreen Pill Instead of Wearing Sunscreen? 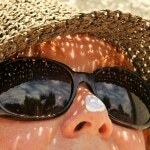 Face sunscreen and Body Sunscreen: What’s the Difference? 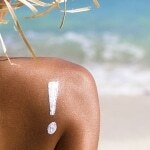 Is Your Sunscreen Protecting You? 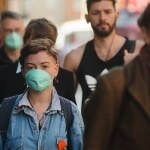 Is It True That Air Pollution Absorbs UV Rays? Store-bought Vs. Homemade Sunscreen: Buy Or DIY?